WELCOME! You have arrived at a place of great tranquility and relaxation. Please, come in. Make yourself at home, and stay a while. This is your invitation to visit and stay at a Rustic but comfortable, all adobe, classical Mexican home of the outback. Provencia de Nuevo Santander (now Tamaulipas), established during the Spanish Colonial Period. for a while; You are most welcomed. things that make up our environs. and/or questions and/or for reservations at privatouring@gmail.com . of McAllen, Texas - Reynosa, Tamaulipas, or between four and six hours of easy driving, depending on your number of stops. of Tamaulipas, in the middle of a truly majestic geographical and cultural settings. Simply by enquiring via our e-mail, we can give all kinds of pointers about road conditions, clean restrooms, snack stops, and so forth. to give directions down to the kilometer post. We have never "lost" a guest. have been here since the 600 a.d. period. The Rio Corona has had a continuous flow since recorded time, which began in the late 1500s. the Mountains, cropping areas, and the remote, inaccessible areas! opportunity to see, hear, and experience the bounty of birds. The Old Gringo appreciates these folks and clients. where we have the best and nicest guests in Mexico, little matter from whence they came. and/or certain other forms of wildlife, especially mammifera, or vegetation,such as bromeliads, types of yuccas, and tropical flowers. We also really do have 470 species of birds on an annualised basis, who call the Quinta, and the area within 25 miles radius, home. other species of butterflies many not seen in Texas. His blood pressure". It just might be. to see weasels, racoons, jaguarundi, opossum, bear, puma, bobcat, coyote, fox,and other beasties but more especially birds. seed and gnat-eaters, and two types of trogons, who come by from time to time. Many are also indigenous and / or frequent and adapted. 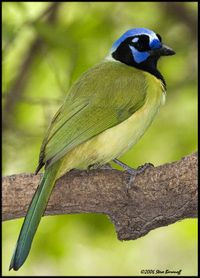 There are always the jays (3 types), mockingbirds (3 types), anis (both grooved and smooth bill), Kiskadees (Texas and Mexican), Kingfishers, and Finches. There are many different raptors, including various eagles and hawks. During the Spring and Fall, migratory birds come from all directions. they had experienced in terms of rustic comfortability, and surprisingly good food and drink. We have had a couple who came back a year later. They wanted to do the walk to Tigre Springs and back, specifically for the mix of birds. 1,470 feet above sea level. includes us. The man who delivers our propane gas has to drive to the end of the road. fox, coyote, raccoons, o'possum, weasel, and others that do not come to mind readily as I write). Your home is all adobe. Spanish military officers during the Colonial Period (1521-1821). arrival. Your room also has a bit of air-conditioning which actually works. and putting on the fan. and Guantanamera during intermittent breaks. KRLD - 1080 Dallas, WOAI - 1200 San Antonio,and WFAA - 820 are good selections. Gringo 60 cycle, 110 / 120 volts and cycles. items that might have been left behind. Dolly Parton could do her coiffure up real proud in this setting. promptly advised, since any unrestricted flow would cause us a bit of a problem with supply. with guests present, in any regard, has been zed - zero. supply from the Ejido is of very high quality. The parlour serves as a dining area, a reading room, a television room, and a conversation site during the colder times. Guests can feel free to raid the refrigerator, or retrieve some secret goody or necessity that has been entrusted there. favourite tea or one of our own availabilities. We frequently joke that we guarantee "absolute boredom", which actually means that ours is a place of "soledad y tranquilidad", solitude and tranquility. and siesta on the corridor. Like the lady told me one summer, "It beats the heck out of paying a therapist". In truth, some drink beer and / or margaritas, relax, and read Agatha Christi, all at the same time. that there is something restorative about being at the Quinta Tesoro de la Sierra Madre. and places to see that are neither distant nor difficult. with 500,000 acres of extension. or a couple of beers there. with the resolution of the contentious issues of the period. and friends. The house is actually very well built, considering that it was put out in the middle of nowhere in 1961.
pioneered there from homes and business interests in Monterrey and Victoria. the delivery of sillares, (huge hewn stone blocks weighing one tonne each). the Old Gringo are going to do something with these buildings. of said Hacienda. Oddly enough, this particular text and the associated picture have always been difficult to hold in place. Some folks think that the place being described is haunted, and perhaps that "spirit energy"
is entering our little page and / or our little computer. one sees the 200 aces +/- with vigourous two-year-old trees. During these times, the 200 acres or so of riverside land has been re-planted afternearly 80 years of producing Valencia Oranges. Those trees had long passed their prime. are already taking their places in line. "keep an eye on things". of basic luxuries one might well not expect on the edge of the wilderness. Rustic comfort is the theme. Texas, and Mexico at the linkage provided here at PRIVATOURING.BLOGSPOT.COM. a little too much at times. Any and all are welcomed to email comments and criticism and approvals. respond to requests for information about Mexico on almost any front. Remember when asking, however, that El Gringo Viejo tends to be very conservative in political and cultural matters. Your responses will be filtered through such thought processes. But, his analysis will be truthful and sincere. His favourite parable is that of the Samaritan, so you will receive fair treatment, friend or foe. accommodation format, and other information is readily presented in readable fashion. It is an English B&B referral service, but includes other places, worldwide. "historical marker - road sign"
for our little mud hut. Its production was overseen by our neighbour at the adjacent Hacienda de La Vega. only on the basis of 'estancias' of three (3) nights more. We have only one guest-room, and it has its own private entrance and bath. We take one, two, and rarely three individuals and no more. There are special rates for weekly (six nights or longer). There is no deviation nor exception to the 3 night minimum rule, for friend, foe, extraterrestrials, angels, or family. The same applies to the rates. the very simple instructions we shall provide if the client wishes to prepay by that manner. We receive no credit cards. THE FAMOUS "LONG, WEST-FACING CORRIDOR"
From here a person can pick his own avocados, or take a long siesta in the cool shade of a warm day. or a couple of cats who think they deserve some special attention. Shoo them off, or give them a treat,as you so will. What we do. What we offer. What to expect. a script, while buying ice and and tending the fire is all part of the parrillada. and really has no fixed charge. Ten or twelve dollars per person, each puts in a bit here and there. and such although it is done just for the fun of it, most of the time. a considerable amount of our own herbs and seasonal fruit. during mealtime. At supper, wine is usually included as a courtesy. All other alcoholic beverages are sold at an extremely reasonable charge. It also helps when our Mayordomo, Alvaro Balboa, is on site since there is very little that he cannot fix or do. We truly are, without complaint, on the very, very edge of civilisation in many ways. Oddly, things that are simple take a little extra preparation to accomplish. Since it is Mexico, the impossible is easily accomplished. It is only the simple things that are difficult for us to do. read their Agatha Christi or whatever, or sit with a nice set of binoculars and a good bird book and relax. They relax profoundly. of ham & cheese, or even a hidden doggy-bone as a reward for being cute. the poisons of life. Birds come close enough to touch, at times. western horizon. Birds are the theme of these moments. Tranquility is the sub-plot. gone dry in its known history. throughout the citrus industry in the world. Many of the "huertas"
the dry season or in case the rainy seasons are late. (We need to note that in early 2019, our neighbour will harvest his first crop of designer limes…a first for the area. further to the south in Mexico in a village named Santa Maria del Tule. say that things are much better when they are cleaner. Go figure. to see the garbage cans, boxes, and other containers lined up along the highway when we go to town on certain early mornings. The people even sweep clean the dirt around their garbage cans. Some times the smallest steps have the greatest effect. mammal or other beast larger than one pound, adult weight. The people of lesser means were in the business of gleaning what few animals out of the wilderness that they could, edible or otherwise. bobcats, and even ocelots, crocodiles, and things such as the mink-like weasel known locally as an"onzas". All repopulation has been from the native population already in place. Our "Green Zone" is not something caused by any solidarity with Al Gore or the Peoples' Democratic Tree Hugging Alliance Against Normalcy. and where anything from bobcats to red and grey fox can be and are seen. flyway for the Mariposa Monarca. (Monarch Butterfly).